Oil Painting Medic: What Art Techniques can I use to Paint Underwater Scenes? What Art Techniques can I use to Paint Underwater Scenes? 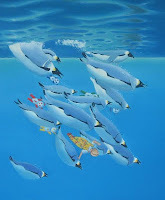 A fascinating subject matter for painting is undersea scenes such as the Great Barrier Reef or the deep. 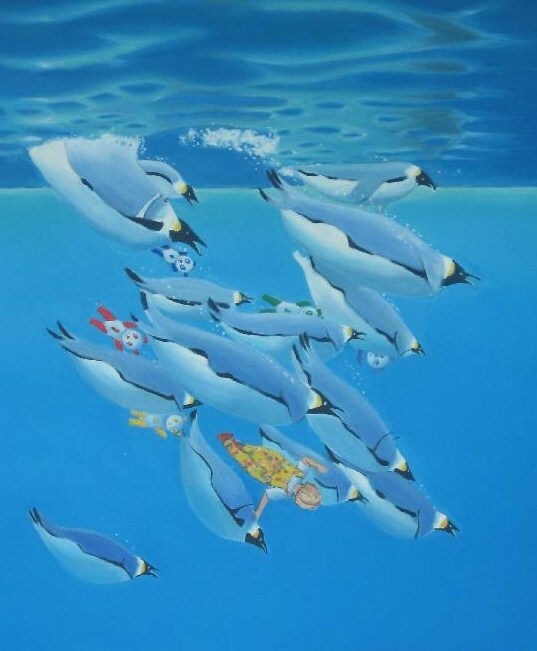 Having completed many oil paintings that feature marine images underwater, I have perfected great art techniques in oil paints to suggest this watery world. Here are some tips on how to paint water. Ultramarine blue, pthalo blue, lemon yellow, permanent rose, burnt umber, viridian and titanium white. Additional blues such as cerulean and cobalt might come in useful. Soft, broad bristles that are slightly worn, sizes 6 – 12 will help create soft brushmarks. Prefer filbert to flat, to avoid perpendicular marks. Fine sables for working around the objects, such as fish and corals, will come in useful. Round sables, sizes 3 and 6 will suffice. Plenty of soft, clean rags will help with achieving soft, airbrushed effects with oils. Painting underwater pictures does not always require lots of photographs, as the watery background will usually adhere to certain rules. Deeper water is darker in color. If the water is clear and there is sufficient light, the shallow water will appear as a luminescent, greenish-blue. Deeper down, the water will appear a deeper blue and may exhibit violet or indigo. Transitions between these colors and shades will be gradual, like the shifts of blue of a clear sky. Further objects will appear more obscured like on a misty day. Nearer objects will appear clearer. Strange patterns from rippled sunlight above will sometimes be seen on objects underwater. The following painting technique must be completed in one go, whilst the oil paint is workable, so allow plenty of time to complete before embarking. I would suggest around 1 to 2 hours or so for an art surface up to size 2 x 2.5 feet. The uppermost area comprises pthalo blue, white and a tiny bit of little lemon yellow (or viridian will do). This layer of water comprises pthalo blue, a little white and a little ultramarine. Here, I used ultramarine, white and a little permanent rose. For this darker area, I used ultramarine, permanent rose and less white. For the darkest area, I used ultramarine and a little burnt umber. White may be added if wanting to achieve a midnight-blue. Very deep water will appear black. For this, I would use ultramarine, permanent rose and a little burnt umber rather than black paint. Once you have worked the paint as smoothly as possible, leave the paint dry for several days. Repeat the process described. Don’t worry if you can’t match the colors beneath accurately; just get a close approximation. This second layer of paint will work with the first to achieve a smoother, more opaque finish. A third coat can be applied if necessary. Painting under water scenes that give the impression of a great marine aquarium can be tricky when trying to achieve a smooth finish to suggest watery depths. But simple art materials and techniques can be used. Notice how shallow water has a greenish tinge if the water itself is clear and sunlight permeates. Deeper water appears more violet, eventually darkening to black. Work carefully around the underwater objects (corals, fish and other objects) with a fine sable. Work darker as you work further down to suggest deeper water. Blend the bands of color together with a soft bristle. Rags will help create smooth effects. Repeat the process once the paint is dry for smooth effects. Take note of how the color of the water impacts upon the color of the objects within, in that they will exhibit a bluish tinge, like that on a misty day. Closer objects will appear clearer. Also observe strange rippling patterns as sun shines through the water onto the objects.